BEIJING, Apr 23 (APP): Pakistan’s Navy frigate Shamsheer took part in multi-country maritime exercises held off the coast of the eastern Chinese city of Qingdao on Wednesday. 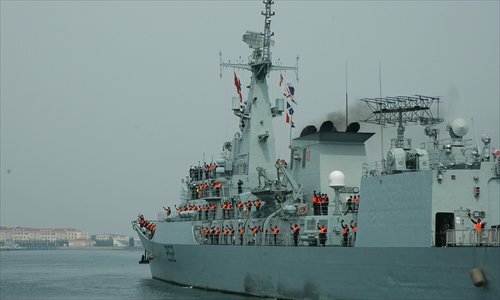 Seven warships from Bangladesh, Pakistan, Indonesia, India, Singapore, Malaysia and Brunei to participating in the drill arrived Qingdao Sunday morning. The two-day WPNS, which will kick off on April 22, will draw on navy leaders from 25 countries, including 21 member states, 3 observer states and Pakistan, which is applying for becoming an observer of WPNS. There were quite a number of changes. The hull was redesigned to better suit the Arabian Sea/Indian Ocean environment. The main gun is a new 76mm with stealth housing. The CIWS is Type 730B served by TR-47C (J band) and OFC-3 photoptic & TV device. Allowance was made into the design so that it can be easily upgrade (or add on) to FL-3000N. SAM used HHQ-7B which is the same as 054. The AShCM was upgraded to a longer range version of C-802 with supersonic terminal stage. Modifications were also made to the living quaters, kitchen equipment and dining facility based on PN customs and traditions. In spite of the increase in tonnage to 3,200 (full) tonne, the CODAD ( four Shaanxi marine diesel driving two propellers) is still able to give the ship a maximum speed of 29.0 knots. The balance is pretty much the same as 053H3.